Yesterday it was confirmed that 200 Canadian troops would remain in the Ukraine for at least two more years. This “training” mission in the Ukraine is on top of two hundred troops in Poland, a naval frigate in the Mediterranean and Black Sea and a half dozen CF-18 fighter jets on their way to locations near Russia’s border. Alongside Britain, Germany and the US, Canada will soon lead a NATO battle group supposed to defend Eastern Europe from Moscow. About 450 Canadian troops are headed to Latvia while the three other NATO countries lead missions in Poland, Lithuania and Estonia. From the Russian point of view it must certainly look like NATO is massing troops at its border. 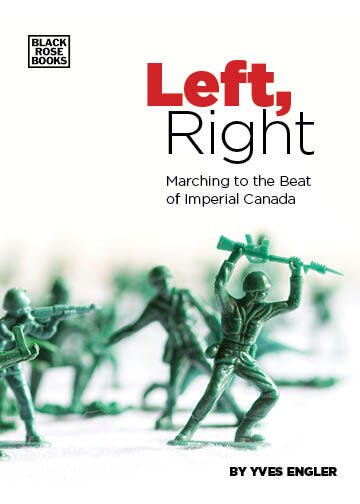 Canada’s military buildup in Eastern Europe is the direct outgrowth of a coup in Kiev. In 2014 the right-wing nationalist EuroMaidan movement ousted Viktor Yanukovych who was oscillating between the European Union and Russia. The US-backed coup divided the Ukraine politically, geographically and linguistically (Russian is the mother tongue of 30% of Ukrainians). While we hear a great deal about Russia’s nefarious influence in the Ukraine, there’s little attention given to Canada’s role in stoking tensions there. In July 2015 the Canadian Press reported that opposition protesters were camped in the Canadian Embassy for a week during the February 2014 rebellion against Yanukovich. “Canada’s embassy in Kyiv was used as a haven for several days by anti-government protesters during the uprising that toppled the regime of former president Viktor Yanukovych,” the story noted. Since the mid-2000s Ottawa has actively supported opponents of Russia in the Ukraine. Federal government documents from 2007 explain that Ottawa was trying to be “a visible and effective partner of the United States in Russia, Ukraine and zones of instability in Eastern Europe.” During a visit to the Ukraine that year, Foreign Minister Peter MacKay said Canada would help provide a “counterbalance” to Russia. “There are outside pressures [on Ukraine], from Russia most notably. … We want to make sure they feel the support that is there for them in the international community.” As part of Canada’s “counterbalance” to Russia, MacKay announced $16 million in aid to support “democratic reform” in the Ukraine. For Washington and Ottawa the Ukraine is a proxy to weaken Russia, which blocked western plans to topple the Assad regime in Syria. As part of this campaign, 1,000 Canadian military personnel, a naval vessel and fighter jets will soon be on Russia’s border. What would the US response be to Russian troops massed on its border? The last time Russian missiles came within 90 miles of American soil, the world came very close to nuclear war. Canada is participating in a “game” of brinksmanship that could end very badly.